A mix of clouds and sun. High 63F. Winds SSW at 5 to 10 mph..
Clear to partly cloudy. Low 47F. Winds SW at 10 to 20 mph. 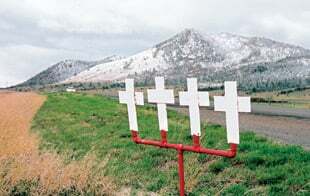 Four crosses along U.S. 287 between Helena and Townsend mark the spot where a fatal accident occurred. Montana chapters of the American Legion have been putting up crosses on Montana roads and highways for 50 years. Each one represents one person killed in that spot in a car crash. The crosses are made from scrap metal and painted white. Montana Highway Patrol Sgt. Jeff Mount stands next to two crosses along U.S. 191 south of Belgrade. The crosses are where Dan Farias and his wife, Tracy, were killed in a head-on collision on Halloween 1992. A rusted cross stands along U.S. 287 near Toston. BELGRADE - Four small white crosses stand by the side of the road, somberly marking the spot where four young people died after an inattentive cattle-truck driver plowed into the back of their car in 1992. Go a few miles down two-lane U.S. 191 near here and there's another white cross, this one marking where a Montana State University freshman dozed off after his first long night of studying and drove into the path of a wood chip truck. Montana Highway Patrol Sgt. Jeff Mount can still point to the spot in a field, 70 yards away, where the car's engine came to rest. Mount pulls his cruiser off the road at two more crosses that stand just inches apart - Dan Farias and his wife, Tracy, killed in a head-on collision on Halloween night 1992 while rushing home from a football game so their daughter could go trick-or-treating. The girl survived. "You just see two crosses. But that's a mother and a father," said Mount, a patrolman for 18 years. He said the crosses sometimes trigger a memory as vivid as the smell of spilled battery acid. "I suppose these white crosses are as personal for the officer as the people involved," he said. Scores of white crosses - nobody knows how many for sure anymore - dot the ditches along roads and highways across Montana. Some are rusted and barely visible among the roadside weeds. Others bear wreaths, fresh flowers and even small flags. Sometimes, a single cross will be the only one on a vast stretch of road. Other places, like on this winding stretch of U.S. 191, they can appear almost every mile, sometimes in clumps of three or four. All of them are part of a program started some 50 years ago by an American Legion member who hoped small, simple white crosses would warn other motorists to slow down and sober up. Statistics suggest that goal has still to be met. The National Highway Traffic Safety Administration said Montana's per-capita highway fatality rate in 2002, the latest figures available, was the third-highest in the country, behind Wyoming and Mississippi. Montana had the nation's highest rate of drunken-driving deaths - twice the national average and 17 percent higher than a year earlier. Despite those numbers, or maybe because of them, Legion chapters across Montana still head out to mark the newest fatal crash sites. Agencies and private donors have created roadside memorial programs in other states, but Montana's is the only Legion program of its kind, said state Department of Transportation spokeswoman Lisa Vander Heiden. Laverne Wagner of Legion Post 22 in Wolf Point estimates he and other volunteers have put up at least 250 crosses in spare weekends on their northeastern Montana district that includes the Fort Peck Indian Reservation. "We usually try to get them as they happen," he said. "Otherwise, we get behind and we never catch up." Missoula Legionnaire Floyd Eaheart is credited with putting up Montana's first crosses in 1953 at the site of a Labor Day crash that killed six the year before. State highway officials approved the American Legion's plan to make the remembrances a statewide program. Roads on private property are usually off-limits. So are interstates because of federal rules. By 1991, legionnaires estimated they had planted enough around Montana roadsides to cover a 5-acre cemetery. And while no official count has been done since, the Legion estimates the number of crosses now stands at more than 2,000 - and growing. The crosses are made by local machine shops from donated or recycled scrap iron. Metal posts are supplied by the state highway department. The crosses bear no names or dates, unless added by family members or friends. While Legion posts use information from Highway Patrol reports when putting up the crosses, Wagner and others said they're more likely to hear from family members who want the victims remembered and, possibly, a place to grieve. "Some of them get so carried away (with decorations), you can't see the cross," Wagner said. Some Legion posts contact families before erecting the crosses. They say it is very rare for victims' survivors to decline a roadside cross, but it does happen occasionally and their wishes are honored. While the markers give some roads an almost graveyard quality, state tourism officials said they had heard no remarks, positive or negative, from travelers or businesses. Larry Stroklund, state chairman of the Legion's white cross project, said four new crosses will be installed and as many as 100 repainted when members of his post, No. 97 in Libby in far northwestern Montana, do their annual maintenance work on the Sunday before Memorial Day. "You plan your vacations around it," Stroklund said. He said about 70 members and spouses show up every year for what has turned into a community gathering, complete with a steak fry and horseshoe pitching once the work is done. The crosses ordinarily seem immune from vandalism as well, though Stroklund said he found one cross in his post's territory with a bullet hole. "They finally picked on one of our crosses," he said.